The number of people who were expected to be diagnosed with cancer this year is sobering, and the number who were expected to lose their fight is simply staggering. According to a report by the American Cancer Society, it was likely more than one million people would learn they have some form of the disease, and more than 500,000 would die from it. That makes cancer the second leading cause of death in the United States, trailing heart disease, which accounts for nearly one in four deaths. These devastating statistics aren’t always common knowledge—until the diagnosis belongs to us or a loved one. And then suddenly, as David Pschirer of Wind River Cancer Wellness Retreats & Programs says, “You become an expert in all things cancer. Carney went through surgery, eight rounds of chemotherapy, and 35 rounds of radiation. Most Tuesdays found her checked into the hospital rather than the office. The only time she felt like herself again was while hiking in the mountains or listening to bluegrass. So she and Pschirer began planning nature treks and trips to music festivals before each round of chemotherapy. These excursions became the initial inspiration for the center set in the woods near Tryon, which also doubles as their home. Nature, both believe, helps reduce stress. Their mission now is to teach participants skills to help them deal with the emotional weight that comes with a diagnosis and treatments. Pschirer, whose background is in engineering and computers, and Carney handle everything from cooking and cleaning to leading exercises. Each session welcomes eight to 10 people and is tailored to individuals’ interests. To that end, guest chefs, musicians, and artists lead classes and activities as part of the four-day getaways. 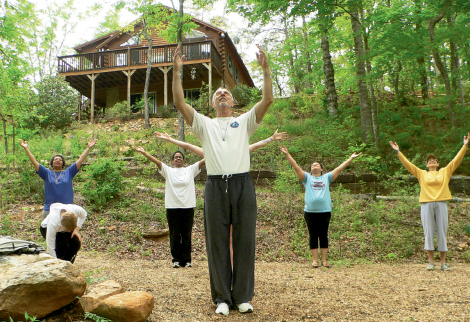 Tai Chi, yoga, Reiki, and massage are additional calming techniques offered. The goal is transformation, to move forward in the journey cancer creates without the disease dictating life. All participants come alone and are asked to unplug from the world, leaving cell phones and Internet connections behind. Carney and Pschirer say there are ample doses of laughter during the long weekends, but it’s also a time when life-long relationships are formed, stories are shared, and participants find the time to contemplate what is important to them and how to focus on those priorities. Wind River operates purely on donations from sponsors and generous individuals, including alumni, which alleviates a potential worry for those who attend. Wind River’s retreats are open to men and women of all ages with all types and stages of cancer. The center holds two retreats in the spring and two in the fall. Participants must be mobile and able to administer their own medication. Pschirer and Carney recently released a CD set of guided imagery and soothing music, which is free to cancer survivors and available to others with a suggested donation of $20. To attend, order the CD set, or make a donation, visit www.windriverservices.org, or call (828) 863-2343.